Ravanor falls from one nightmare into another in this chapter of Knights of the Fallen Empire, but at least he’s not alone, this adventure is just getting started. 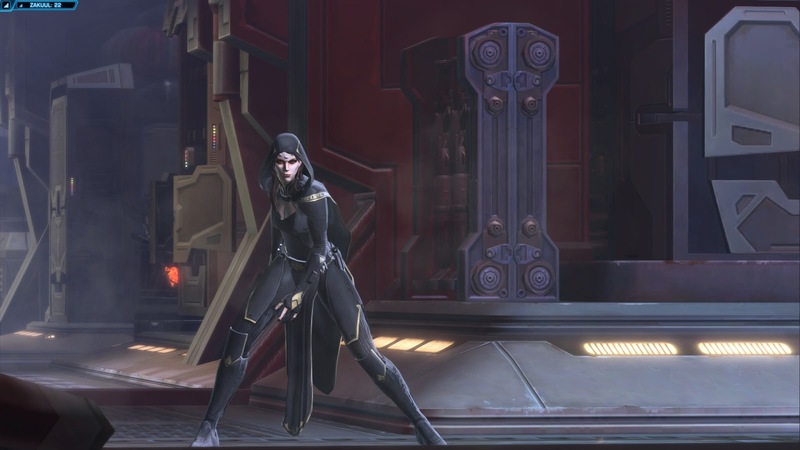 It’s not the refined visage of Valkorian that greeted Ravanor’s thawing eyes, but the familiar and far more welcoming face of Lana Beniko, long-time ally, lover, and more recently the Minister of the newly formed Sith Intelligence. To counteract the carbon poisoning Lana shot Ravanor with a terrifyingly large hypodermic, making the already unpleasant procedure all the more painful. 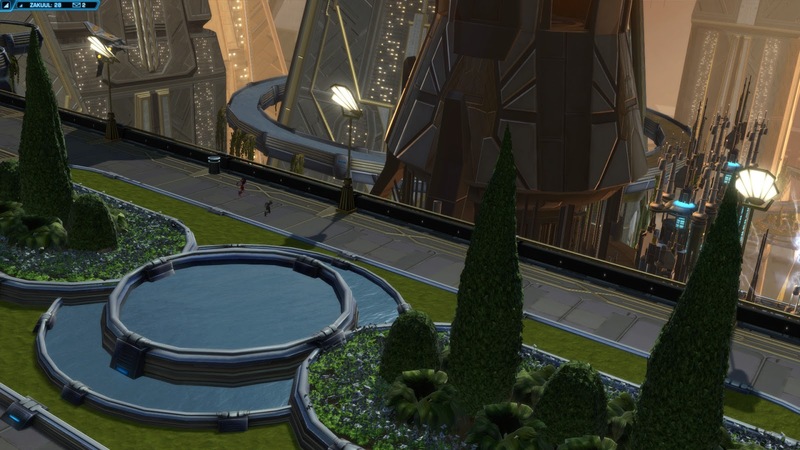 As his vision returned Ravanor noted a T7 astromech droid working at a wall terminal behind Lana. An aside, Lana has undergone a minor but certainly noticeable redesign, her once severe features and awkward hair have both been smoothed, it’s a welcome touch up; her rough spots were the result I suspect of comparatively crude rendering, her original model looked lower quality than most others. Additionally, the astromech is the very same T7-01 that accompanies the Jedi Knight throughout their class story. 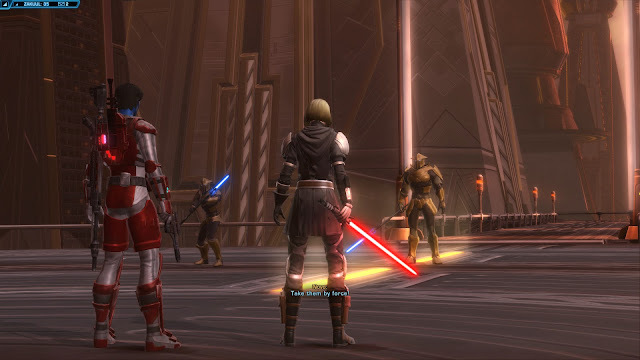 Their reunion was cut painfully brief, a trio of merciless white Skytroopers charged the vault that held Ravanor, one of Arcann’s many prisoners by the looks of it. As Ravanor and Lana blasted their way through security, she revealed that they aren’t in a prison at all, rather a storage vault containing Arcann’s most prized ‘possessions’. The pair stopped at a sealed security checkpoint and Lana checked in with the rest of her extraction team, the pilot Koth Vortena was introduced. His ship hangs conspicuously from the side of a building somewhere in the city beyond. Then they noticed a figure on one of the security camera feeds; a hooded woman and a golden armoured soldier in the very vault they just fled. 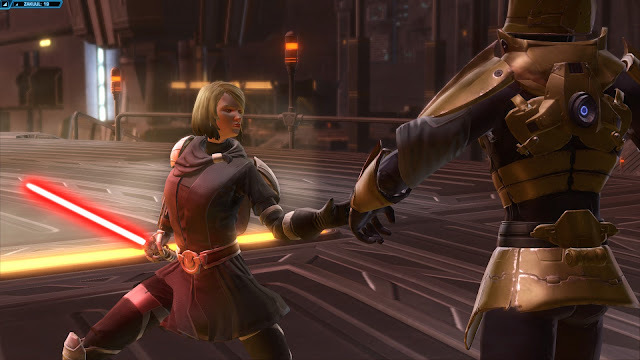 The woman was Vaylin, daughter of the late Emperor Valkorion, irritated by the Knight’s manner Vaylin snapped the man’s neck with a flick of her wrist. Resolved, Lana gathered her Force powers and held the security doors open long enough for them to dive through, putting one more bulkhead between them and the unhinged Force-user Vaylin. Lana led Ravanor through a Zakuulan tower; furnished white and crisp, the civilian décor possessed an air of elegance that neither the warmer Republic, nor more oppressive Imperial architecture could hope to match. All the while Vaylin was in close pursuit, rather than hold the security door open like Lana did, she blasted it aside with apparent ease. 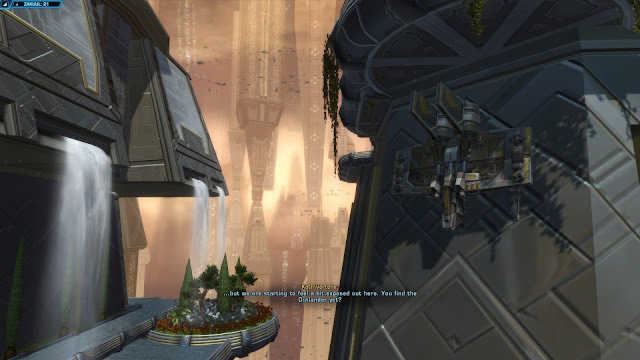 Meanwhile Koth was ousted from his hidden perch, by a wing of the Eternal Fleet’s circular starfighters, the fight passed just in front of the glass elevator Lana and Ravanor took down from of the tower. Ravanor’s flight saw them battle through a walker-led ambush on a sky-bridge, lush with vegetation, straight into the heart of a Skytooper manufacturing plant, home of course to various models of Skytroopers. Vaylin, ruthless in her pursuit ripped the very infrastructure of the city apart, she tore pieces from a reactor tower and launched them across skyline at Ravanor with little immediate effect. 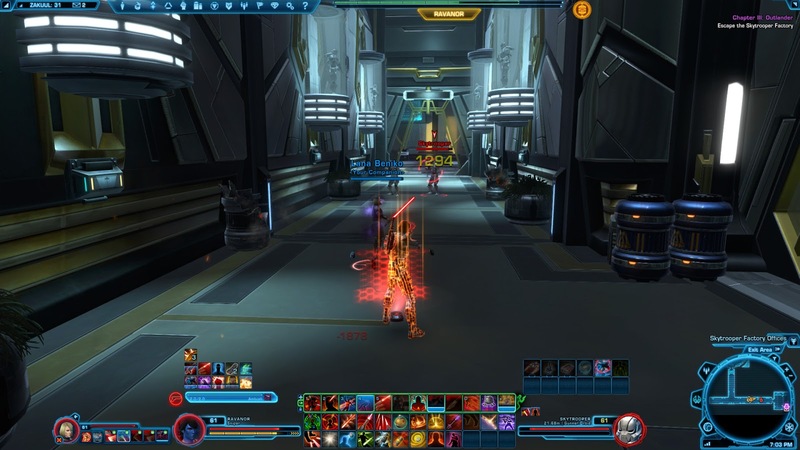 The gameplay at this point took on a tangible sense of urgency, in no small part to the unabated use of epic Star Wars music. The combat remained far easier and faster than what would be considered normal for the game at this high level, but that only made it more enjoyable for me. 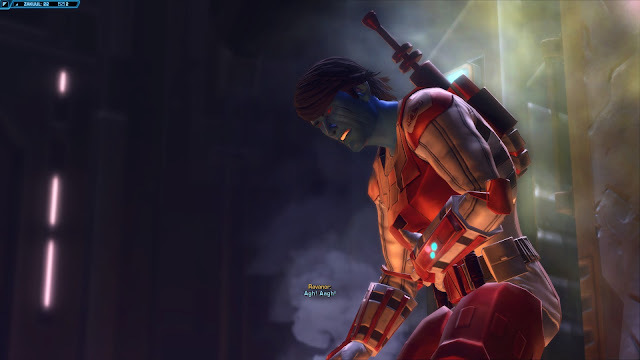 The rush I felt throughout this chapter was not something I have experienced in a long, long time in The Old Republic, and while action games can create that same rush on a dime, few feel as meaningful as this. I’ve followed Ravanor on and off for almost four years, I don’t have exact numbers but I feel confident saying I’ve never put more time into any other role-playing game character, that investment makes the events of this expansion feel all the more consequential. They cleared the droid factory only to face with an even greater obstacle; the sun machine. 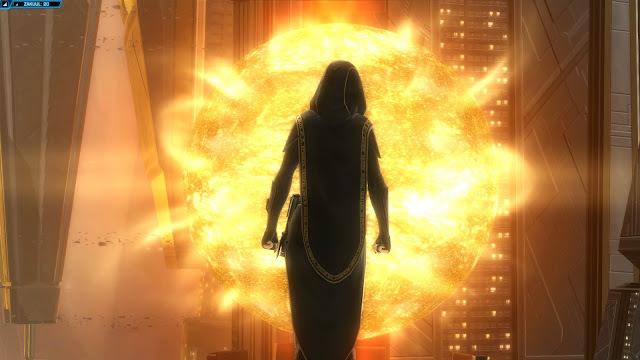 The reactor, the burning sun-like structure that Vaylin ripped chunks off to throw at Ravanor, has naturally destabilised. Ravanor now has two choices; Koth implored him to power down the reactor, thus saving the lives of thousands who would be caught in the imminent blast, but Lana saw the impending disaster for it really was, an opportunity. It wasn’t a difficult choice, rather than intervening the pair continued towards their pick up coordinates, deciding to use the decaying reactor as a form of cover, to keep a step ahead of the Eternal Empire. Koth’s situation had degenerated further; his ship now laid a smoking wreck and cloaked security agents rushed him from all sides, calling Lana he asked they hold on for just three more minutes. 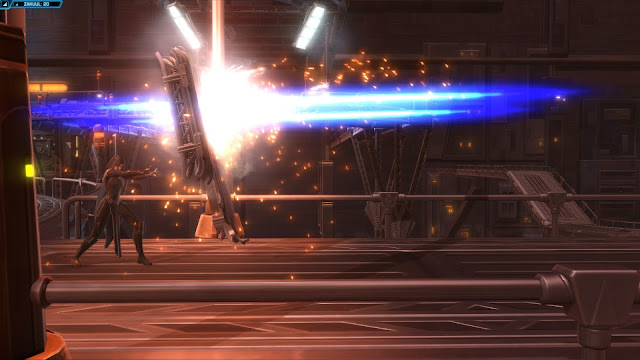 On another set of the landing platforms, Ravanor and Lana find their exit impeded by a pair of Knights of Zakuul; Force-users with no alignment to either the Light or Dark side. They accused Ravanor of having killed their immortal Emperor Valkorion, Ravanor pointed out the poorly constructed logic of that accusation, but the confrontation was inevitable. The Knights were of course no match for two battle-hardened veterans of the Great Galactic War. The larger, bulkier Knight named Novo leapt to safety, calling for his smaller partner Tanek to do the same, but Lana gripped him in the Force, and prepared to cleave the life from his helpless form. Ravanor advised against it; they were clearly no real threat, Lana disapproved but allowed the bested Knight to flee with his companion. Despite the victory, the fight with the Knights had slowed them and allowed Vaylin to finally catch up. Lana resigned herself to battle once more, however Koth had different ideas. Piloting a stolen Zakuulan shuttle, he rose to hang above the platform and opened fire with twin laser cannons. The screaming salvo of laser fire obliterated Vaylin’s Skytrooper backup and forced her onto the defensive, briefly, using the Force she wielded a sheet of metal flooring as a shield. Lana and Ravanor threw themselves aboard the commandeered shuttle, curiously Ravanor was helped aboard by a somewhat familiar assassin droid, clearly a HK model. Vaylin doesn’t remain sheltered for long, as Koth gunned for an escape, she launched the scrap of metal she had used as cover at the shuttle, damaging its engines. On the ground Zakuulan defence turrets powered up and began to track the shuttle, but the astromech T7-01, still in the city was able to prevent them from firing at the wounded craft. 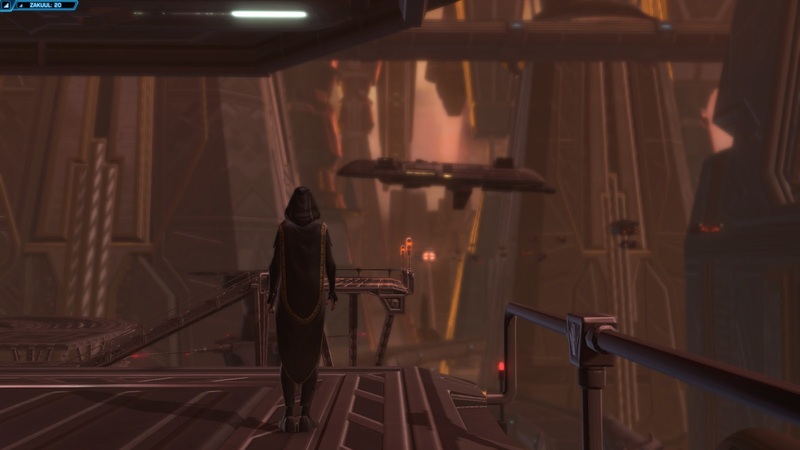 Back on the landing platforms, Vaylin stood gazing after her retreating enemy, a contingent of Knights formed up at attention, including Novo and Tanek. She addressed them but rather than simply reprimanding them for their failure, she choked the life from Tanek in front of his fellow warriors. Aboard the shuttle Lana and Koth revealled that Ravanor had been frozen for five years.